To center the childcare debate around tax breaks and minimal subsidies is insulting to all working women. Donald Trump recently patted himself on the back for actually presenting a plan to rescue the nation’s overstressed moms. While some say the initiative shows that the debate over working women’s struggles is now truly bipartisan, it also shows how regressive the political conversation on gender inequality remains. 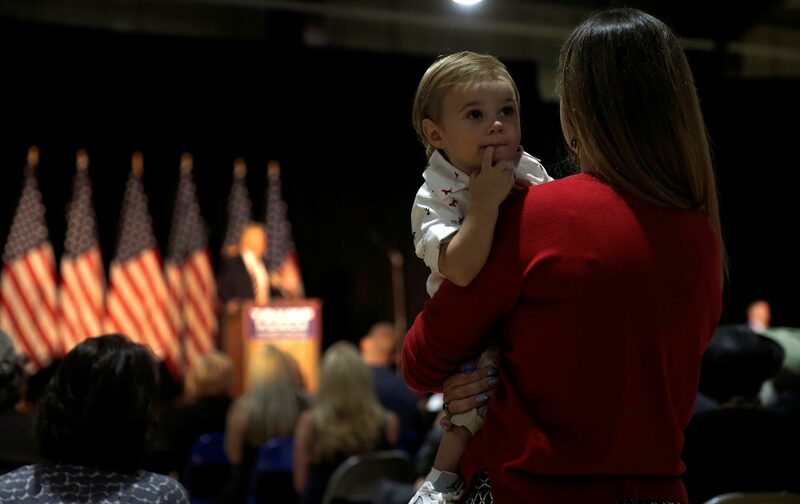 Trump’s plan offers six weeks of paid maternity leave (note that it’s only for mothers), funded by a speculative windfall supposedly generated through fixing “fraud” in the unemployment insurance system. The underlying assumptions are that (1) maternity leave should be guaranteed, but an employer has no obligation to extend this benefit to men so they can be caregivers to their newborns as well, and that (2) there’s enough abuse in the (deeply underfunded) unemployment insurance trust that getting rid of “cheating” will save a meaningful amount of money—an extremely dubious prospect, according to analysts. Out in the real world, more progressive proposals have been introduced or even implemented on the state and national level. The proposed Family Act, for example, not to mention Clinton’s plan, would provide income for up to three months’ leave for a range of family duties including self-care and parental leave, replacing about two-thirds of a worker’s regular salary. So a benefit that’s intended to direct much-needed funds to women caring for newborns could lead to more gender discrimination. Hardly a boon for women in the workplace. On top of the half-baked family-leave plan, Trump’s childcare plan essentially amounts to a glorified tax credit that might cover one month of daycare for a typical urban household. This is simply not sustainable on a practical level but, more troublingly, it also disregards a key blind spot that has hampered the advancement of early childhood education and childcare as a pillar of the welfare infrastructure: treating this as a serious job and a real, vital workforce. Currently the childcare system is broken on both the consumer and labor ends. Basic center-based childcare programs cost the average family over $11,500 annually, virtually pricing out many low-income households. Moreover, federal subsidies only reach a fraction of the women who need it currently. Trump’s plan would barely dent that figure. But another side of the problem is that while services are wildly expensive, the wages childcare workers earn remain dismally low—so low that women who do this work can barely afford to care for their own kids. That’s why childcare workers have been on the front lines of the Fight for $15 movement to demand fair wages. Trump’s plan throws chump change at a crisis that is crushing working moms as consumers, and impoverishing working mothers as care workers. The disrespect for working women embodied in Trump’s plan speaks to a blind spot in the election-season debate on gender inequality—on both sides of the political aisle. The gender pay gap and the “motherhood penalty” of caregiving costs—extra burdens women bear as parents and workers—reflect both the economic pressures facing women income earners, on the one hand, and the barriers to advancement they face on the other. Both these forms of inequality overlap with racial and class polarization as well—a structural injustice of which the childcare gap is just one facet. According to IWPR, “half of all households with children under 18 have a breadwinner mother, who is either a single mother who heads a household…. At the same time, women are more likely than men to shoulder unpaid caregiving responsibilities and many women, especially women of color, are more likely to be balancing work and care alone.” So they’re expected to do the work of both traditional gender roles, yet are still relegated to a subordinate tier of the workforce. Within the wage gap, racial and gender hierarchy reinforce each other. About eight in 10 black mothers and two in three Native American mothers are primary household breadwinners, compared with 50 percent of white mothers and 47 percent of Latina mothers. Black, Latina and Native American female breadwinners are generally more likely to be single mothers, compared with whites, and also earn less and get fewer basic benefits like paid leave. These inequalities persist despite several generations of women’s advancement in society and despite women’s wielding growing political influence. They are arguably the byproduct, in fact, of a culture of neoliberal femiinism and historical injustices that have allowed white middle-class and educated women to advance at the expense of much-less-privileged women. Specifically, what we call the ascent of women in the postwar era has opened doors for women in the corporate workforce, so that middle-class professionals have much easier access to family leave and workplace flexibility. They also can exploit a low-wage caregiving workforce, which is made up largely of poor women of color, in order to make it possible for them to work outside the home. They can afford to take time off for their children because their workplaces are structured to protect her long-term career prospects—while keeping women at the bottom down. Compare this situation with that of, say, a working-class immigrant woman of color raising children as a single mom. She is actually deterred from working when the cost of placing her child in the local daycare center eats up all her wages. She could be attending college, perhaps, but educational ambitions are unaffordable if she wants to provide for the basic needs of her child. To center the childcare debate around tax breaks and minimal subsidies is insulting to all working women, but it is monstrous for the women at the bottom end of the income scale, who suffer as both workers and as parents. All this boils down to one of our two major party candidates proffering a solution to gender inequality at work that would drain already-depleted safety-net funds to provide nominal benefits for relatively advantaged mothers. It seems that the way for a woman to ascend the opportunity ladder in the 21st century is to ensure that, every step of the way, someone’s replacing her on the bottom.